The Golden Rule: Be Kind to Animals. Published by the American Humane Association, and used with permission. We have focused on the years between 1880-1945 because of the number of different visual techniques and approaches that were undertaken by those advocating for Humane Education during this period. The goal of this exhibition is to illustrate the dynamic and multi-faceted approach taken by these pioneers. In addition to highlighting this often-overlooked history, this exhibit aims to bring the message of Humane Education to current audiences by connecting them with the historical trajectory of animal welfare and animal rights. It is our hope that the work of these early reformers will capture the imagination of a new generation of activists. We invite you to read about the early Humane Education movement, to explore the images and visual culture that were so crucial to this movement, to take a moment and listen to some 19th century Band of Mercy songs, to look at artwork created by people like Morgan Dennis, and to learn about the courageous men and women who so firmly believed in the power of Humane Education to make a difference for all species. 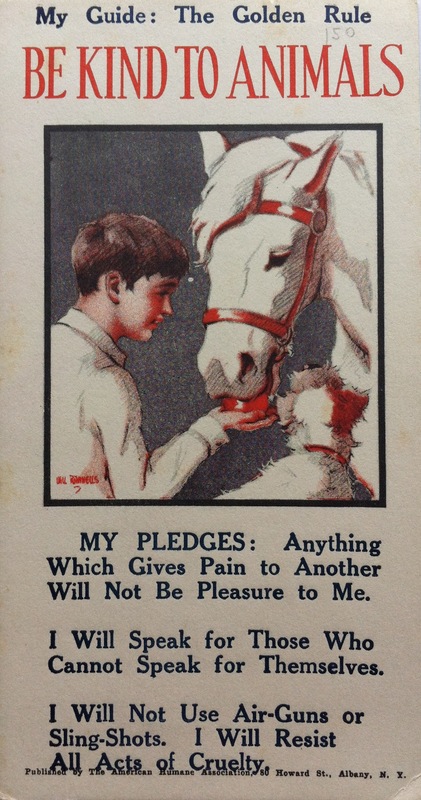 “Be Kind: A Visual History of Humane Education, 1880-1945” is presented by the National Museum of Animals & Society. It was curated by Dr. Keri Cronin, Chair of the Department of Visual Arts at Brock University. Dr. Hilda Kean contributed text on the early Humane Education movement in Britain. The exhibition features items from the National Museum of Animals & Society’s collection. In addition, objects and archival sources from individual and public collections in Canada, The United States, and Britain are used in this exhibition. Is there a way to get reprints of the article, or poster? I believe a booklet of this would be very marketable. Is there one available or just info on line? Thanks. Love the art work and message. Ciana – these posters sometimes come up on online auction sites like Ebay. They are collector items today.